concert band located in Marietta, Georgia. to provide educational opportunities through musical skill and artistic excellence. Help send the band to the 2019 Tournament of Roses Parade. Show your support for the Lassiter Band. 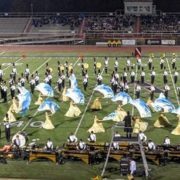 Lassiter Bands is an award-winning high school marching and concert band located in Marietta, Georgia. 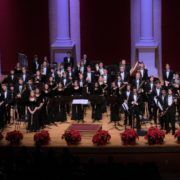 We are deeply dedicated to our amazing music programs and currently boast a membership of nearly 200 high school music students. We compete and perform at venues all over the United States and have a dedicated staff that guides and encourages our students. We set high expectations for ourselves and our students, and they always rise to the occasion. Our supportive parent community and Lassiter Band Booster Association raise funds that support our efforts, making it possible for us to continue to provide an excellent band experience for all. Band members share a common spirit of pride, enthusiasm, and devotion to the band that extends far beyond their four years of high school. In addition to the highest quality, rigorous musical instruction there are many other benefits to joining band. Band provides leadership training to all interested students, with opportunities for further in-depth training for selected students. Learn the value of working together and come to understand how your individual effort impacts the group as a whole. The band is an expansive and highly integrated social community, where you will make friendships that will last a lifetime. Band encourages habits and choices that move students towards excellence through a rich and diverse range of opportunities in and out of the classroom. The experience of performing on the field and on stage provides an invaluable opportunity to build a sense of pride and self-confidence. Enjoy football games from a unique perspective and travel across the U.S. to participate in once in a lifetime events like the Macy’s and Rose Bowl Parade. 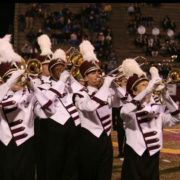 The 200-member marching band program is an integral part of the overall program at Lassiter. The Marching “Trojan” Band has performed before many large and prestigious audiences including having twice performed for the President of the United States, the 1984 World’s Fair, 1986 and 1995 King Orange Jamboree parades, the 1991 Blockbuster Bowl, the 1988 and 2001 Tournament of Roses Parade, the 1997 Citrus Bowl Parade, and the 1999 Macy’s Thanksgiving Day Parade. The Marching “Trojans” accepted invitations to perform in the 2004 Macy’s Thanksgiving Day Parade in New York City and then 37 days later in the 2005 Tournament of Roses Parade in Pasadena, California. Our prestigious band consists of four different concert bands. Filled with passion, wisdom, and integrity, each one has its own unique style. Each ensemble has earned superior ratings with their memorable performances. The color guard at Lassiter High School is a part of the marching band and music program. 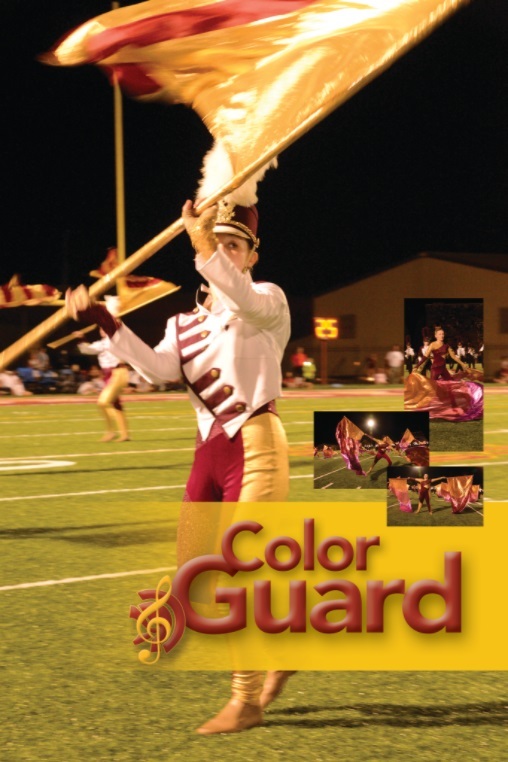 During football season, the color guard is an integral part of the marching design, color palette, and musical interpretation of the show. The guard uses props and equipment, along with movement, to express dynamic passages in the music accompanying the marching band show. Winter guard is an indoor color guard activity derived from military ceremonies or veterans organizations ceremonies. Unlike traditional color guard, winter guard is performed indoors, usually in a gymnasium or an indoor arena. 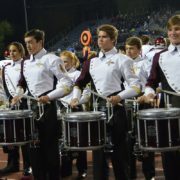 The percussion program at Lassiter is comprised of 35 students that perform with the Lassiter Marching Trojans Drumline, three large percussion ensembles, as well as several small chambers groups. All of the percussion Ensembles at Lassiter are extra curricular and rehearse entirely after school. The percussion students at Lassiter are trained in a variety of aspects of percussion and have an opportunity to perform with not only the above ensembles but also in one of four concert bands and a jazz bands.